An all-occasion “masculine” card! Steampunk Style. Stampendous has teamed up with IMAGINE Crafts®/Tsukineko® this month and sent all of the members of the AIRs team some of their adorable stamps. One of the sheets of clear stamps that I received is called “Steampunk Charms” and that is the set I chose to use for this card. 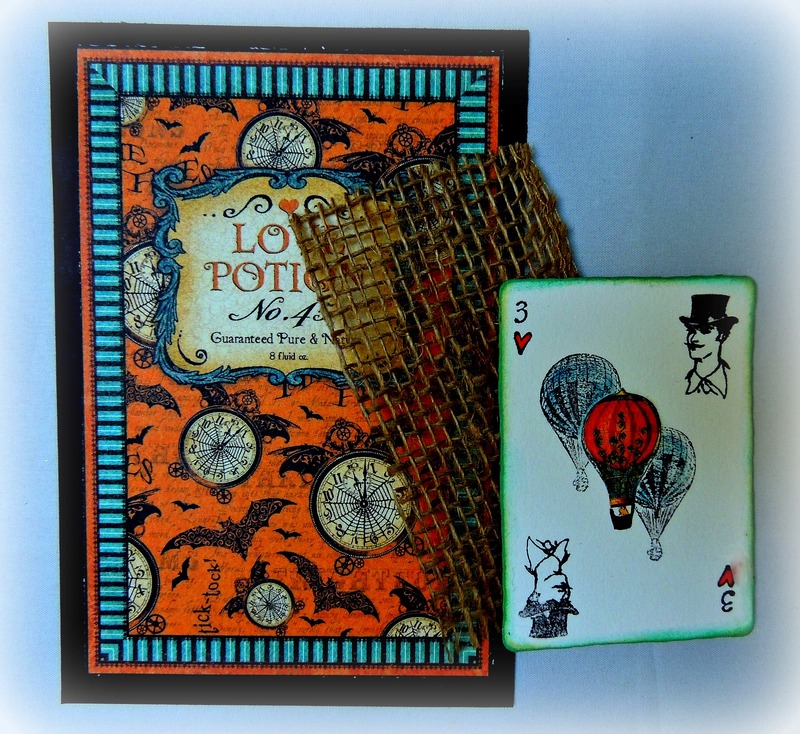 Graphic 45 has a collection of wonderful, colorful papers that are new called “Steampunk Spells” so I thought this would complement the theme perfectly. First I started by stamping the man’s image on an ATC to make it look like a playing card. I stamped three balloons in the center and then stamped the number 3 and tiny hearts in either corner. I colored in the balloons with IMAGINE Crafts®/Tsukineko® VersaColor™ Pigment Ink Cyan Blue using an IMAGINE Crafts® / Tsukineko® Fantastix™. I have one of these Fantastix™ dedicated to different colors so I can use them over and over. The tiny hearts were colored the same way using IMAGINE Crafts®/Tsukineko® VersaColor™ Pigment Ink in Orange. I distressed the edges of the ATC with Cyan Blue too. Now that the stamping is completed I applied IMAGINE Crafts® GooseBumps™ Texture Spray sparingly by unscrewing the bottle and using the plastic tube inside like a paint brush. 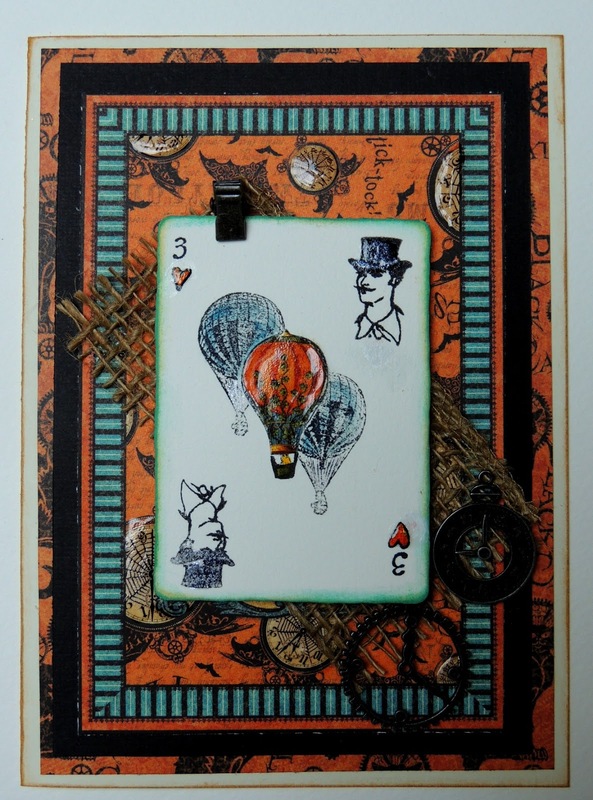 I applied small amounts to the men’s hats, the hearts and the center balloon, which is a small balloon cut out of the G45 paper and glued over the stamped balloon in the center position. The ATC is set aside to dry completely. Assembling the card is simple; each piece of matting is 1/4” smaller than the last. I cut a panel out of the paper to place the burlap, card and ephemera on. Then the black card stock and the black cat paper under that. The entire panel is attached to the blank cream colored card. I put a mini clip on the top edge of the ATC. A quick swipe of IMAGINE Crafts® / Tsukineko® Memento Luxe™ Mixed Media Pigment Ink in the lovely Peanut Brittle color distresses the edges perfectly. I applied IMAGINE Crafts® GooseBumps™ Texture Spray sparingly by unscrewing the bottle and using the plastic tube inside like a paint brush again to the clocks that are on the paper panel behind the card. It just gives it a little more sparkle.